This time it is Burtons! That's a perfectly legit way to read it, as 20% off does not mean the same as getting the VAT back - hence it must be two separate offers. I filling in the feedback form on their web site asking them to confirm it is 20% off, *and* the VAT back. 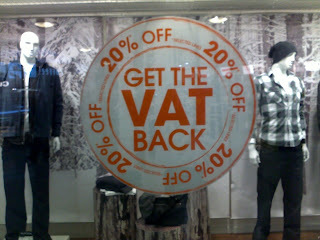 But surely if they give you 20% off, they are giving you the VAT back? You save £24, of which £20 is the VAT. So you do get the VAT back, with the bonus that you get a little more too.